A few days ago, the Huawei P30 Pro prototype was circulated, and reportedly the cellphone will carry 4 cameras. From the latest leaks, the feature seems to be truly present but it is increasingly clear that cameras will have different sizes. You can find the Huawei P30 Pro on fonehouse.co.uk. The three cameras will consist of a standard camera, ultra wide angle, and telephoto, while the other one will be under the flash. Slashleaks reveals new images from the rendering of the Huawei P30 Pro mobile concept. It was mentioned that the P30 Pro carries a complex array of cameras. There are dual cameras and one more lens underneath. Not only that but in addition to the dual camera, there is also a smaller camera system on the right. There are lots of rumours regarding laser cameras that might be pinned on a cellphone. It may be that the arrangement of this camera has the ability of a laser camera, which is similar to the iPhone 12 which is reported to be released in 2020. Regarding innovation, Apple is usually a bit behind Android. That said, LG is also reportedly working on a laser camera at this time. It seems that the lens system is surrounded by two sensors located above and below. Other specifications are a 6.5-inch screen, Kirin 980 processor, 8GB and 12GB RAM, 128GB and 256GB internal storage, 4 rear cameras, and a 4000 mAh battery. Interestingly, in the launch event, Huawei will also release Huawei Watch GT Active. However, for certainty, you must wait for March 26, 2019, at the event in Paris. Huawei P30 Pro is also rumoured to have a water-drop screen and has 5G connectivity. 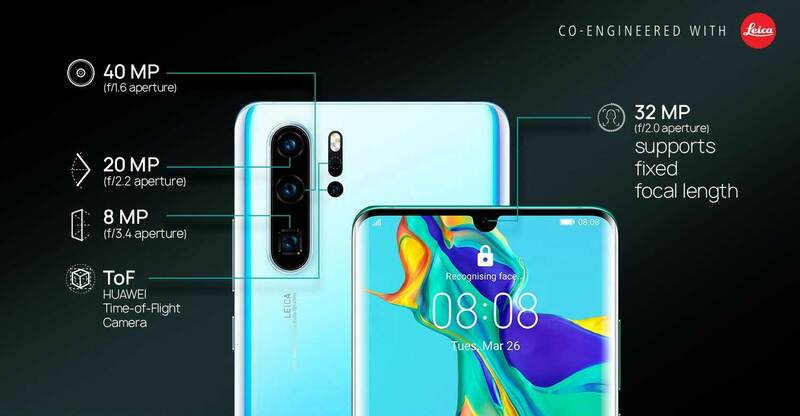 Previous articleAll variants of OPPO Reno will come with liquid cooling!